Providing you the best range of 6 Strand 4mm Multi Colour Tourmaline Beads Necklace, 7 Strand 3mm Multi Colour Tourmaline Beads Necklace, African Amethyst 75.00 Cts Faceted Drops Necklace, Stunning 14 Strings 1850 cts Ruby Plain Beads Necklace, Stunning 16 Line Natural Yellow Sapphire Beads Necklace and 7 Lines 381cts Real Ruby Beads Necklace Set + Free Gift with effective & timely delivery. 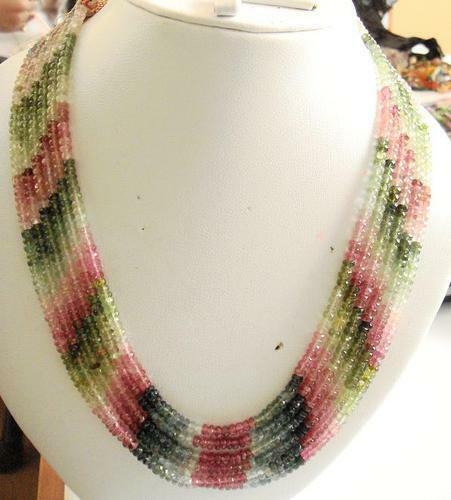 Mindblowing 6 Strands Tourmaline Beads Necklace With Multicolour Tourmaline. The Best Quality OF Gemstones From The City Of Gems And Jewellery "Jaipur"
Mindblowing 7 Strands Tourmaline Beads Necklace With Multicolour Tourmaline. The Best Quality OF Gemstones From The City Of Gems And Jewellery "Jaipur"
Very fine 75. 00 cts african amethyst faceted drops necklace . Mindblowing 14 Strings Of 1850.00 cts Of Fine Ruby Beads Makes A Marvelous Ruby Necklace Which Can Cove Your Full Neck And Has Eyecatching Looks. The Colour Shading Of Beads Is Absoulately Fine , Each And Every Piece Has Same Luster And Colour. Its a must buy product for sapphire lovers.